Last week Merdeka day arrived earlier here than it should be. 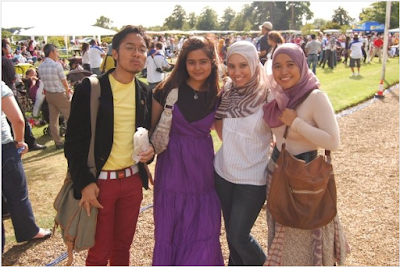 The Malaysian community held a Karnival for us Malaysian and also for the locals who wanted to enjoy Malaysian cuisine. I guess it has something to do with the Ramadhan around the corner. For us it was a heaven of foods as most of us spend time try to cooks rather than buying. But for the locals, it was more of a new foods to experience. The heat of Ramadhan month is arriving again starting tomorrow.With almost everyone gone home make my homesickness worst. However, tonight I'll be first time fasting as somebody's wife. I've been busier than ever with my work. There's so much I need to catch up on as most of my colleagues are off to Glasgow by Monday for the EUSIPCO conference. Me? I'm here in the office trying my best to get things done. Yesterday was our first year anniversary since we got engaged. It was nothing to celebrate to but just to mark down that it has been a year since I wore a ring. Even so, I just can't help to share that my adorable husband was being very nice by giving me a present. Isn't he a doll. Meanwhile, there is this emptiness in the house with 'cat' no longer being here. Cat has been rehome to a single mother whose daughter is leaving for university life. She loves black cat and the family is animal loving. So we decided cat would be happier with her. she told us cat is happy. We'll miss cat dearly. ada balik hari tu?selamat ramadhan..
sweet like chocolate la hubbymu ituu..
Salam Ramadhan Dan Salam Ulangtahun Pertunangan Hana'!! salam ramadhan to u n hubby! Owh!!!! "there's an emptiness" ble cat daa takde, aya kuar mse tu takde pape pun akak ckp! Eh, selamat berpuasa to u and ur husband too!